Harness the power of 3D Presales to reimagine and transform your Presales vocation with these battle-proven techniques and best practices for the Presales professional. Harness the power of 3D Presales to reimagine and transform your Presales vocation with these battle-proven techniques and best practices for the Presales professional. Whether you are new to Presales, just a novice finding your path, or a seasoned professional, this book has experience and knowledge that will benefit your journey. 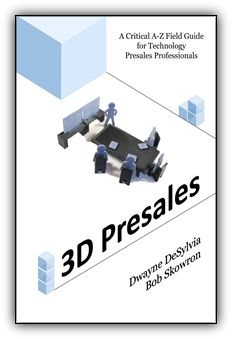 3D Presales provides a guide around Presales topics, giving definition of what it means to be a Presales professional and how to excel at doing it. Sales Executives, Presales management and other roles can benefit from teachings of this book. NOTE: Purchases can be made using the cryptocurrency ETN. See this blog for more information.